A few days ago, I posted a description of my recent visit to Jerusalem, and I was accused of anti-semitism by one irate reader. I guess that’s an occupational hazard whenever you write about Israel in anything other than glowing terms, although I did take the trouble to mention the things I admire about the country as well as some downsides. My sister – who recently visited Palestine and wrote to UK Prime Minister David Cameron protesting about the treatment of villagers in the occupied territories by the settlers – sent me an interesting link to an Israeli site the other day. Machsomwatch.org is run by a group of female Israeli activists who send daily reports from the numerous checkpoints between Israel and Palestine. The reports, pictures and videos from the site make fascinating and disturbing reading. Here is an example written by a British woman who has been working in Palestine as a volunteer through a Quaker organisation. Her comments are personal, and don’t necessarily reflect the views of the organisation for which she works. I could hear the noise of a great crowd long before I could see them. It was 3.45 am and I was heading with two other ecumenical accompaniers (EA’s) to the Bethlehem 300 checkpoint. This long narrow caged pathway is the main way into Jerusalem, through the enormous concrete separation wall, for Palestinians who rely on travelling there each day to earn a living. Hundreds of men are already queuing. Many have been there since 2am and are squatting down on the floor. The turnstile out of sight in the distance, will not open until 4am. I follow Jean as we squeeze through, trying to avoid stepping on anybody’s legs, slowly moving up the long queue. We grab the bars of the cage to stop us from falling as even though the men try to make space for us everyone is tightly packed. Occasionally I hold on to Jean’s identifying jacket to try and stop the tide of men closing the small gap before I can follow her. I try to stay calm as it would be easy to be overcome by panic, so many people, so enclosed, all intent on moving in the one direction. I close all thoughts of the Hillsborough disaster from my mind. The pathway ends at a small square caged room and we can go no further as it is packed and still more are pushing trying to get in. Just after 4am the turnstile starts to let the men through one at a time. We wait and then it is our turn to go through and show our passport to the soldier. Another EA on the other side of the cage is counting the men, women and humanitarian cases that pass. We continue on across a yard to join another queue to get into a large warehouse with a raised walkway for security guards and soldiers. My journey is now over as our task is to observe the men queuing to get through the metal detectors, similar to those you have at airports. Only one is open when we arrive. All three should be open at 5am and we have a phone number to ring if there are too many delays. We can only tell that the metal detector is working by the queue slowly moving behind the screens and the noise of the trays, for belts and belongings to be placed in, being slid back for the next man. I have only seen one person at the passport check, and one other looking down on us from the walk way, it is all automated and faceless. How can you appeal to someone or question a decision if you cannot see the people? One man I spoke to told me it had taken him two hours to reach this point since leaving home. Two and a half thousand people went through the checkpoint while I was there and it takes between one and three hours depending on the person operating the turnstiles, passport control, ID sensors and metal detectors. No information is given about the reason for the frequent and sudden closures or the potential waiting time ahead of the men and there is no one to ask. The economy in Palestine is in such a poor state that the only way these men can feed their families is by making this daily crossing into the Palestinian area of East Jerusalem and some go further and cross into Israel and those that have a job are the lucky ones. A Palestinian cannot enter East Jerusalem or travel further, without his identity card, his work permit and his hand print matching the papers. Israel will not allow Palestinian men to enter until they are 28, although another told us the age was 32, which is possible as the rules are constantly changing. 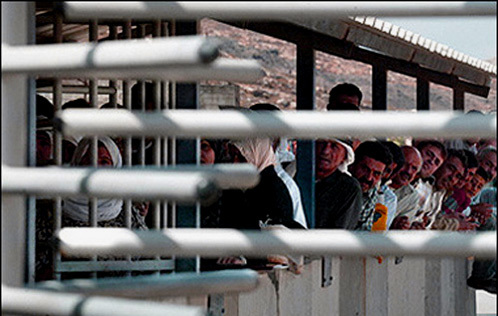 To enter East Jerusalem and Israel to work they must have a work permit, which they obtain through their employer who must be registered and who has paid the tax on “foreign workers” by the 15th of the month or the work permit is cancelled, many workers only discover this at the checkpoint. There are according to Machsomwatch*, many incidences of corruption and forgery with work permits, even when valid an employee is unlikely to challenge an employer over any illegal or dangerous practices in the workplace, as they would risk having their work permit cancelled. My morning is over and with the other EA’s I head back to the house and bed for a few hours’ sleep. For the men no such luxury, they will put in a full day’s work before returning to Bethlehem, knowing they will face the same ordeal the next day and every day of their working life, but only if they are “lucky” enough to get the correct paperwork! It is time we changed that favourite Christmas Carol and the world no longer goes silently by when such injustices are happening in Bethlehem. I believe that the checkpoint she was describing was the same one through which I entered Bethlehem. We entered during the day by coach, so I can’t say I witnessed a scene comparable to that which the correspondent describes. As I understand it, the majority of the volunteers are Israeli. It cannot be easy for them to do what they do. I think the words in the report speak for themselves, and if publishing them here makes me an anti-Semite in the eyes of some, I’ll take that on the chin. Hi GSW, those Palestinians have lived on those lands for 100s of years – as have Jews, Christians, etc… … They are hardly foreigners. One religion has simply gotten the upper hand in a space once shared. You can understand the initial driver, but the legacy has been awful for pretty much everyone – even the Israelis who seem to have lost their moral compass. Moreover, I do not think the situation is as gentle or as civilized as landing at Heathrow and having your passport checked. While I admire the work done by the friends, sometimes they are a little starry-eyed. This volunteer feels that the daily workers are treated as “foreign workers” (her parentheses). Why is everyone reluctant to admit that Israel does not belong to the Palestinians? They are foreign workers. When I enter a foreign country I show my passport, visa etc. Why shouldn’t they? Not one word about the Jewkilling that creates this situation. Sad. Bob, Paranoid delusions, and projection are treatable conditions. Oh yeah, God promised it to you, everyone is an anti- semite, and remember the holocaust. have i forgotten anything. Bob, the purpose of my article was to note that there are some within the Jewish community in Israel who are as concerned as international observers at the treatment of Palestinians passing through the checkpoints. Sufficiently concerned to have kept watch over the past ten years. It is easy to tar non-Jewish observers with the brush of bias and anti-semitism – not so easy when the observers are Jewish themselves. As readers have reminded me in the past, Israel is a society with a tradition of free speech. Long may that continue.